1. Find mentors and leaders to follow. As hard as it may be to fathom, even a Founding Father needs a role model. When a young Thomas Jefferson enrolled in the College of William & Mary, he quickly latched onto George Wythe, the first law professor in the United States. While Jefferson (deservedly) gets the lion’s share of credit for titanic historical American landmarks like the Declaration of Independence and the Louisiana Purchase, who knows if he ever would have been in the position to change the world without the teachings and guidance of his mentor? Tim Berners-Lee, Founding Father of the Internet. When embarking into the world of social media, don’t think that you or your company can simply plow ahead without learning from those who have done well before you. Unlike Jefferson, you are not constrained in your choice of role model by geography or institutional affiliation. Find social media personalities who you admire and want to emulate, combine the best aspects of the way they do what they do, and you’ll find yourself infinitely better off for it. 2. Treat social media as your Monticello. Always build, never finish. Jefferson inherited the Monticello plantation from his father when he was only a young man, and spent literally the rest of his life altering and improving it. He changed which crops were farmed, he completely redesigned the house to reflect the newest and most fashionable architectural trends in the world, and he added new buildings to allow for functions and experiments his father never even dreamed of trying. Can you get your SM profiles looking this nice? Likewise, you need to approach your social media presence the same way. Simply creating a Facebook page, a Twitter account and a LinkedIn profile is not enough – it’s just the foundation. Constantly adapt the way you present yourself and engage others online. Don’t shy away from new programs and networks – embrace them actively. You can always build and improve, so don’t ever stop! 3. Declare yourself. In the summer of 1776, Thomas Jefferson wrote a certain Declaration that ignited a pretty big conflict between the British Empire and some of its colonists that would take years to resolve. He may have upset some people, but you can’t deny he was upfront. While your social media accounts probably won’t launch any political revolutions, you should leave no questions unanswered about what you stand for based on your profiles. Are you a VP of a software startup using social media for the sole purpose of generating leads? That’s fine – don’t feel the need to hide it. 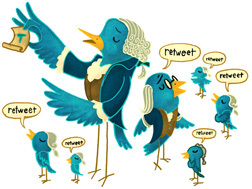 If only the Second Continental Congress could have been live-tweeted. And if you’ve got some truly revolutionary ideas worth sharing – don’t pretend that you don’t! Social media is the primary way you’re going to get them out there. 4. Lay down the law. Thomas Jefferson was the 2nd Vice President of the United States, which also made him the 2nd President of the United States Senate. Around the turn of the 19th century, the Senate lacked many of the procedural guidelines that govern it today, and its processes were chaotic and time-wasting. Thomas Jefferson decided he was going to set down some rules to make the upper house of Congress more organized, and they’re still in use today. Establish best practices for social media use in your company, or even just for yourself. Having guidelines to work from, and having everyone on the same page, will not only cut down on you or your people using social media the wrong way, but will also give you and them the confidence to go above and beyond in using social media for whatever purposes you and your company have decided. 5. Explore and expand. Perhaps Thomas Jefferson’s most famous accomplishment as POTUS was completing the Louisiana Purchase. He doubled the size of the young United States by purchasing some formerly French land from Napoleon Bonaparte for what can conservatively be described as a bargain. He then sent Lewis and Clark on an expedition to explore America’s new backyard, and what they found led to the eventual expansion of American society from coast to coast. Social media doesn’t have that pesky Pacific Ocean in the way. Social media presents you with the unprecedented opportunity to reach out and expand your network, for a bargain. You can explore yourself, you can designate employees as Lewis and Clark, or you can do both. More like-minded thinkers and potential buyers exist in the vast SM wilderness, and their numbers grow every day. Jefferson grew the US for a ridiculously low price; you can grow your business by leaps and bounds for even less. 6. Educate, share and give back. Thomas Jefferson’s proudest feat was not authoring the Declaration of Independence nor serving as the 3rd President of the United States. It was founding the University of Virginia. He believed that education was the foundation of a free society, and he wanted nothing more than to contribute to the formation of young minds that would continue to serve the country he helped birth. Jefferson built UVA. SM presents the opportunity for you to build your own knowledge hub! Your social media outlets should be a valuable source of information for whatever target audience you set out to reach. Not only will your followers gain from it, but they will appreciate you for it. And like a university, your accounts shouldn’t be just the origin of resources – they should compile any worth sharing. The more you put out, the more you will take in. Just as founding UVA was Jefferson’s favorite part of his own legacy, this principle should be the bedrock of the way you approach social media. Happy Independence Day from Explorics! We hope you enjoy a celebration filled with cookouts, fireworks, and Instagrams of both.